NETWORK FINALS: THIS IS US and THE GIFTED gained 0.1 in final numbers. 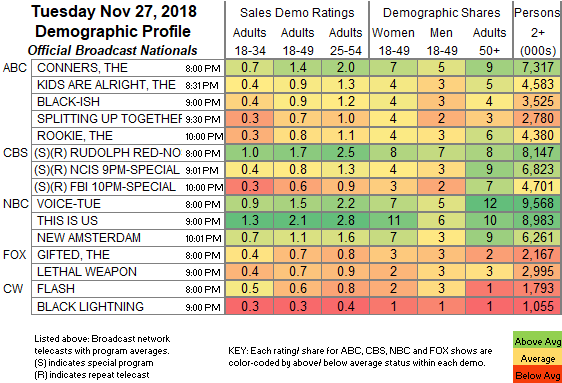 CABLE HIGHLIGHTS: On USA, WWE SMACKDOWN rose 0.12 to 0.81, and REAL COUNTRY was up 0.04 to 0.21. On History, CURSE OF OAK ISLAND gained 0.08 to 0.76, with a pre-show at 0.36, and BROTHERS IN ARMS was up 0.03 to 0.27. Bravo’s BELOW DECK jumped 0.13 to 0.66. ESPN’s COLLEGE BASKETBALL doubleheader was at 0.60/0.43, and the week’s CFP RANKINGS show was down 0.02 to 0.35. MTV’s THE CHALLENGE ticked up to 0.45. Adult Swim’s TENDER TOUCHES was at 0.37/0.32. Food Network’s CHOPPED was steady at 0.36. On ID, THE NIGHT THAT DIDN’T END was at 0.35, BODY CAM premiered at 0.33, WELCOME TO MURDERTOWN held at 0.27, and HOME ALONE was at 0.20. TBS’s THE GUEST BOOK lost 0.02 to 0.34. A&E’s SCIENTOLOGY & THE AFTERMATH returned at 0.34. MSNBC’s RACHEL MADDOW SHOW led cable news at 0.32/0.49/3.3M, with CNN’s ANDERSON COOPER 360 at 0.24/0.32/1.4M, and Fox News’s HANNITY at 0.23/0.40/3M. Paramount’s INK MASTER was down 0.03 to 0.27. 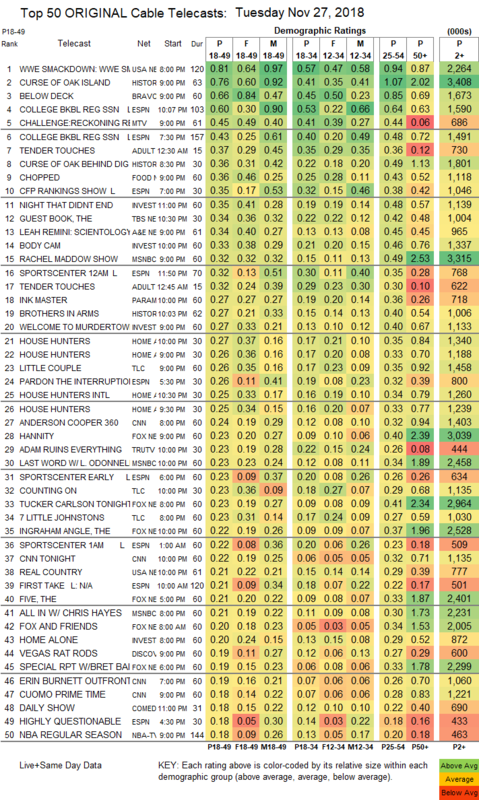 On HGTV, HOUSE HUNTERS was at 0.27/0.26/0.25 compared to last week’s 0.26/0.22/0.22, and HOUSE HUNTERS INTL was up 0.02 to 0.25. On TLC, THE LITTLE COUPLE gained 0.06 to 0.26, 7 LITTLE JOHNSTONS was up 0.04 to 0.23, and COUNTING ON was at 0.23. Tru’s ADAM RUINS EVERYTHING returned at 0.23. On Discovery, VEGAS RAT RODS climbed 0.04 to 0.19. On Lifetime, HAPPILY EVER AFTER was steady at 0.14, and HONEYMOON ISLAND ticked down to 0.09. Comedy Central’s GOATFACE special was at 0.08.